I love tarts and especially I love tarts with fresh berries. They always look and taste amazing, and they make a perfect summer dessert. 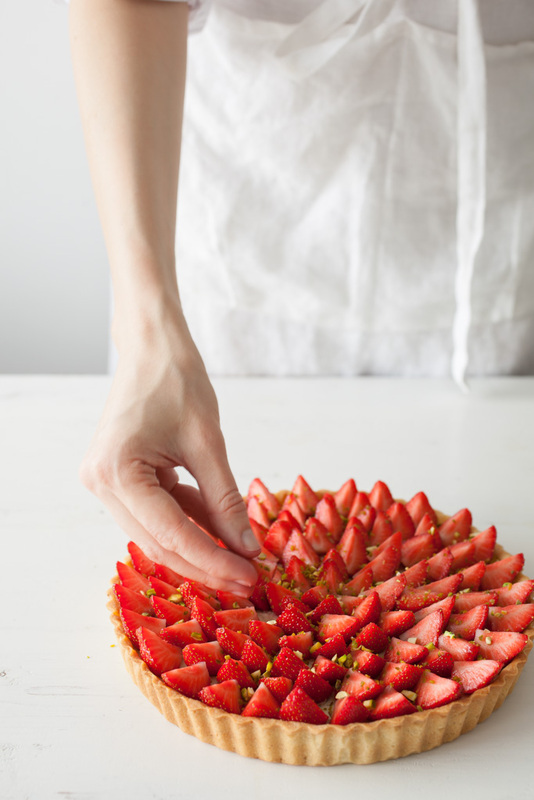 I baked this Strawberry Pistachio tart in July, before our 3-weeks trip to Russia (you can see more details of this trip on my Instagram feed), unfortunately I didn't have time to share this recipe back then, but I hope you still will be able to find nice local strawberries till the end of this summer. 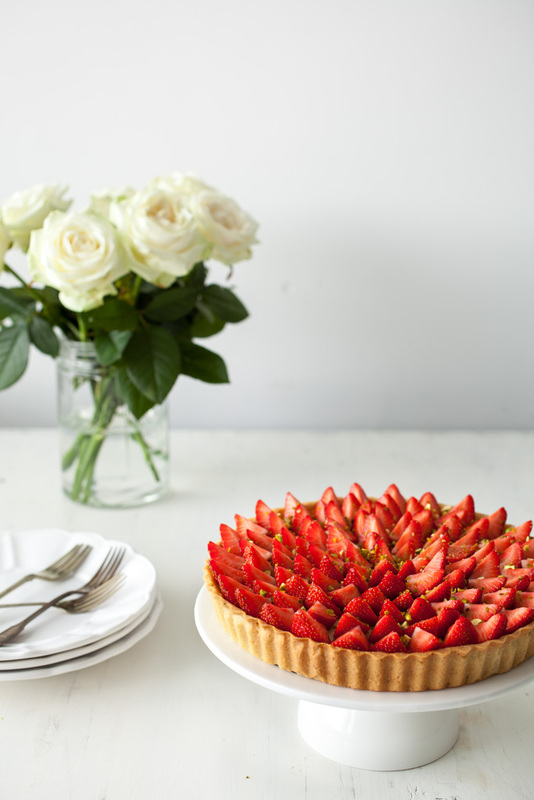 Because this tart is definitely worth all the efforts and I'm sure, you will love it, as I do. 1. Combine sugar, salt and butter in a big bowl. Using the tip of a knife, scrape out the seeds from the vanilla pod and add them to the bowl. With your fingertips, mix and cream everything nicely, then add the egg and work it delicately with your fingertips. 1. You will need a tart tin 20-24 cm with removable bottom like this one. Lightly butter it and chill on a baking tray. 2. Roll out the pastry (pate sablee) to a round, 3-4mm thick. Drape it over the rolling pin and unfurl over the tart tin. 3. Line the tin with the pastry. Trim off the excess pastry, gently press the pastry edges up the side of the tin to form a fluted lip, about 2 mm. Chill for 20 minutes in refrigerator. 4. Preheat the oven to 180 C (350 F). Pierce the chilled pastry all over with fork. Line it with baking paper, fill with beans or peas (it will prevent the dough from rising or "sliding"). 5. Bake for 15 minutes. Remove the beans and paper and bake for a further 10-15 minutes, until lightly colored. 1. Soak the gelatin in cold water for 15 minutes. 2. Put the strawberry puree and sugar into a saucepan over a medium heat and cook for about 5 minutes, don't let it boil. When the puree is hot, but not boiling, remove from the heat and add strawberry piecies. 3. Drain the gelatin, squeezing out the excess water, and add it to the puree, whisking to dissolve. 4. Let the compote cool to room temperature, then pour the compote to the chilled tart crust. Place in the refrigerator until solid, about 4 hours or overnight. 2. Split the vanilla bean lengthwise and scrape the seeds into a saucepan, add milk, pistachio cream and bring to a boil. 3. Whisk the egg yolks and sugar together in a bowl to a light ribbon consistency. 3. Drain the gelatin, squeeze out the excess water and add to the cream, stirring to dissolve. 4. In another bowl, whip the cream to soft peaks. Using a rubber spatula, gently fold the whipped cream into the pistachio mixture. 5. Spread the cream in the crust over the strawberry compote. Cover and chill at least 1 hour. 1. Cut the strawberries in quarters. 2. 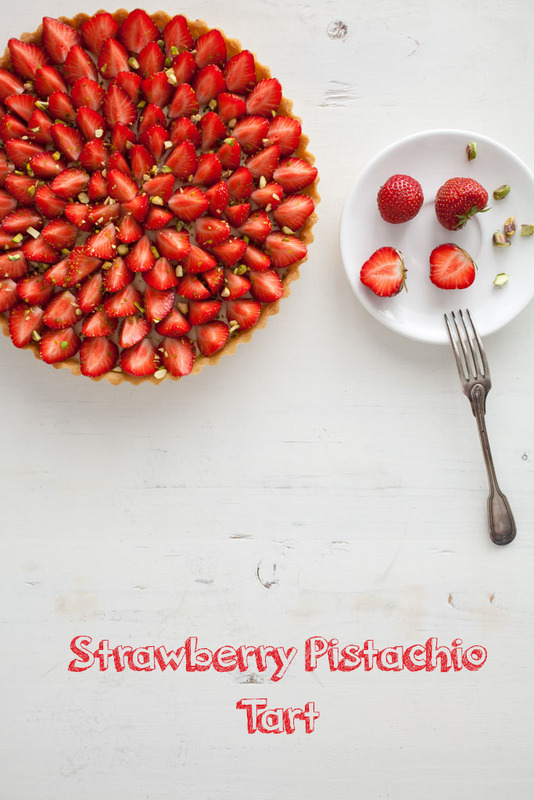 Starting from the out edge, arrange strawberries in an overlapping circular patten, stemmed side down, on the top of pistachio cream. Sprinkle with chopped pistachios. 3. Refrigerate until ready to serve (1-2 hours)*. * If you are not going to serve the tart the same day, it's better to brush the strawberries with warmed strawberry jam or jelly. It will prevent them from drying out. If you will make this or other recipes from my blog, don't forget to share a photo on Instagram, using the tag #toetjeaddicted_recipes. I would love to see your creations! Deine Bilde sind so schön!! Thank you, Romain :) combination is wonderful indeed!